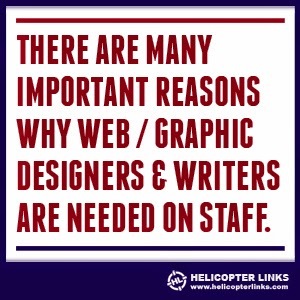 We are offering some free tips on having a complete website and here's why: Helicopter Links offers one free link to every helicopter related company in the world and is staffed by web designers and graphic designers. 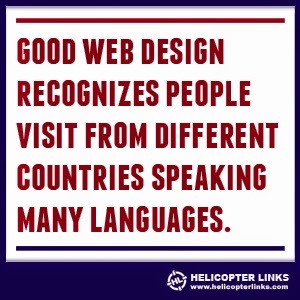 We review each company website before approving them to be listed on Helicopter Links and therefore have seen many websites in many languages from different countries from around the world. We see websites based in the USA which don't say USA on their contact page. We see the same problems from websites in every country not listing their country of origin. This is an awareness and common courtesy issue. Internet users know the web is worldwide, know that anyone can visit a website, and that many companies do business internationally and potential customers need to know if they are visiting a website in the right or wrong country or have a need to know which country they are based. 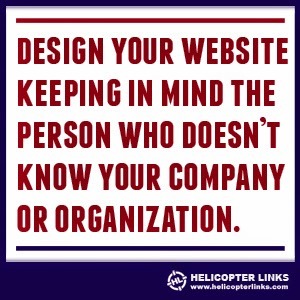 So, our below website tips (it's more of a short book) are not only from our web design training but from our experience in seeing many incomplete company websites in the helicopter and aviation community. Our tips get a little detailed but we hope our tips help your company website to be more complete and useful to your current customers and new customers. Having a website is a good first step! If you have a website, you are doing better than some businesses! If you don't have a website, getting a small one page website (at least) is recommended and is extremely useful for current and new customers to contact you. When building or updating a website, imagine that some people who visit your web site will have never heard about your company. The horror! We've seen many companies write about their company as though the only people viewing their website are those people who know their company intimately. Not good. It's better to have your website written for those in mind who don't know your company. Imagine a person who by accident or on purpose finds your website. Are you making it easy for the person from another country, a new customer or a person new to your industry, to understand the function of your company, its services offered and where it's based? A well written company website will even help current customers know more about what you offer and might help you increase sales from your customer base. Even if you sell only locally, it's better to make a company website with a worldwide audience in mind. What if a new customer is from outside your local area or based internationally? There's a good chance this will ultimately help your company grow. Look at competitor websites for ideas. Look at any well made website for good ideas to help make your website complete. Websites need to be truthful. Statements such as, "We are the only company that..." or "We are the best company that..." raise a red flag. State was is true. Is your website current? Is the copyright on your website dated from several or more years ago? Is the copyright over 10 years old? Best to update and review every web page on your website at least once a year. Remember, websites are different than typing on paper. Before computers, we abbreviated things to save space due to limited space on a piece of paper and we underlined words because we had no other way to emphasize words. Today, we don't need to abbreviate words on websites, there is plenty of room and we use bold, italics, color, font size and font type to highlight important words. Are there other good reasons not to abbreviate words? Not everyone knows what you think is the is an accepted abbreviation. Mfg, mfgr, manf, mfr, mtfr these might be considered by various people as correct abbreviations for the word "manufacturer"? What about people in other countries? Do they recognize these abbreviations as being correct? ("Mfg" can stand for Molded Fiber Glass, Mixed Flowing Gas and With best regards (in German, that is, Mit Freundlichen Grüßen). If the word manufacturer is spelled differently in a foreign language, then an English abbreviation will be meaningless to people and translation websites will fail for the internet user. Best to use acronyms as little as possible for the same reasons above. What are some good reasons to use acronyms sparingly? Many people in the business world know what FYI, TBD, and RFQ means but not everyone knows what these mean! If someone doesn't know what FYI stands for, they might think it means, "F... You Idiot!". FYI means, For Your Information. TBD means To Be Determined. And RFQ means Request For Quotation. However, even commonly used acronyms might have multiple meanings. For each individual web page on a company website, we'd recommend to spell out the acronym first, then follow with its definition, example: RFQ (Request for Quotation). Then in all other instances on that web page, okay to use the acronym. The same is true for abbreviating cities, states, provinces and countries. Who in the United States knows what NSW means? (NSW means New South Wales and is the name of a state in Australia.) How many people outside of the United States knows that GA is the abbreviation for the state of Georgia? Why abbreviate cities, states, provinces and countries on any website when it's extremely easy to write them out and will end the confusion and frustration. Never underline any words on a website for emphasis, we bold or italicize. The only underlined words on websites are live links. FYI: We never underline words on paper anymore, with computers, we bold our fonts or italicize now on paper. If you still underline words on paper, it's time to get out this bad habit. The computer is not a typewriter. Is your website written for the person who doesn't know your company? Does your website explain what industries it serves? 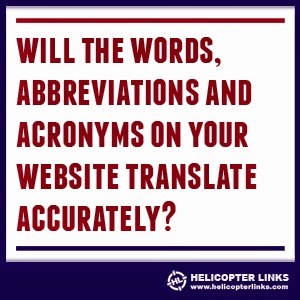 A well written website will say it serves the helicopter industry. 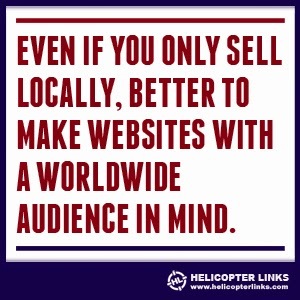 If you say you sell to the aviation community but don't elaborate, why would a helicopter operator stay on your website? Better to explain that you serve the helicopter community only or that you service both helicopters and fixed-wing aircraft. If you service fixed-wing only, why not say this so you are not wasting the time of helicopter operators and vice versa. Do you note that you serve the general aviation community, small, medium and large businesses including airlines, governments and militaries? Explain what you do. Do you work on UAVs? It's good to help people know if they should be on your website or not. If you work on helicopters and fixed-wing but only have pictures of fixed-wing aircraft on your website, then how to people know, for sure, you work on helicopters? If you have a picture of an large passenger airliner jet on your website, how do people know you work on small private aircraft? Pictures tell the story well. Multiple pictures of different types of aircraft and rotorcraft are better than one picture of a passenger jet. Why allow people to turn away from your website because they are under the wrong impression you don't or can't service their needs? Do you list all your services? Is your website complete. Do you have an "About", "Contact", "Products and Services", "Industries served or Expertise", "News", "Events", "Media" and "Gallery" links? Is it easy for people to find your social media links? "Careers" and "Investor Relations" are usually for larger companies. Why a photo gallery? This helps for many reasons. It helps customers understand what your company does. If high resolution pictures are available, it helps any member of the press to print pictures of your company products in print magazines. All high resolution pictures can be made into low resolution pictures by the press for website publication. As a web designer for several web sites, I know that few people write to companies asking questions. With an FAQ page, having three or four questions is not enough. A good FAQ web page has a complete list questions to help those people who don't know about your company and to learn about your company. The "About" page is about your company. Not about the owner. If you want to highlight one or more employees, that's on another web page sometimes called "Team Members". Or if the company is explained in the first paragraphs of the "About" page, then the "About Team Members" can follow. We've seen many companies listing their company name, address and contact information in the "About" section of their websites. This is actually the wrong place to list this type of information. Your company name, address, phone, fax number, email addresses, etc. belongs on your "Contact" web page. If your company logo is an acronym, it's best to explain what the acronym means on the "About" page. This helps people understand your company. If the acronym is out of date but still used and has a new meaning, it's still best to explain it's original meaning, then explain it's updated meaning and how you prefer to have your company referred to. This helps people understand what your company is about and helps people write it correctly by the press, customers and others. This explanation would best be made in the first paragraph of your "About" page. It might seem hard to believe but many businesses don't list their full business name or business address on the contact page. There are businesses which have zero contact information on their "Contact" web page. Most people who need to call, email or need the address of a company will visit their contact page, and when basic contact information is missing, it makes it extremely frustrating for the internet user. We've seen many websites which only have a contact form on their "Contact" page. This is frustrating for people who want to call your company. Now here's a reminder to write out your company's full official name on your "Contact" page. Why? We've seen many company web pages which do not have the official name of their company spelled out in text form online, they just rely on their logo at the top of their web page. This is very confusing to people who don't know, for sure, the name of your company. It's not a good practice to assume that everyone knows exactly how to spell out your company name. There are a variety of company logos and we've seen many company logos use an acronym but their company name is several words. It's better to type your official company name as text with your full businesses address including city, state and country, phone numbers and email address. If you have a physical and mailing address, they can both be listed. This will eliminate a lot of confusion. If you have multiple offices, the headquarters should always be noted and easy to find. If multiple company locations are listed by city or country, best to have your headquarters listed at the top. Is your phone number, name of company and address at the top or bottom of every web page? Are you making it easy for people to call you? A buyer might leave your site since it's not easy to find out how to contact your company. Are the words on your website text and are your inks in text? If yes, they can all be translated. If any link or web page is an image, they can't be translated. Do you have PDF brochures on your website? If yes, they cannot be translated by the average internet user. Do you really want PDFs on your website which can't be translated? Are you updating your site or is your admin doing this? This is a trick question. The best method for updating your site is with a writer, web designer and graphic designer. If you are a very small company, then you can usually find a person who is a web designer and graphic designer. If you can't afford a writer, then it's important for the business owner to take responsibility for ensuring that each web page is edited, spelling errors are corrected and to make sure the writing is as grammatically correct and easy to understand as possible. Are all your graphics current? Are your images clear and crisp? Do you know that all web images need to be at 72 DPI? Are your pictures so small that you can't see them? Do you know that you need both "ALT" and "Title" tags on each of your images. When you scroll across each of the images on this blog entry, you'll notice the words now appear as text. This text can now be translated even though the graphic cannot be translated. A web designer knows what "ALT" and "Title" tags are. Are you testing your website for functionality and testing it on multiple browsers? How's your logo? Not good? Not sure if it's good or not? If you don't know much about logos, it's best to get in touch with a graphic designer and ask if you have a good logo. If not, this is a project that should eventually be worked on. Have you paid a skilled graphic designer for a good logo? Good logos should cost in the range of thousands of dollars. Why? Your logo needs to last for years and your logo represents your company. A logo needs to be made for print, web, for faxing, color, and black & white purposes. There is more to logo making, than a business owner just saying, "I need a logo for my company." If you are being quoted a small amount of money for a logo, you might just get what you pay for. A not so good logo. Do you answer the phone with a "Hello?" or "Repair Shop" or a voice mail system (which many people are tired of and people might simply hang up) or does every employee answer your phone by saying a standard polite and friendly phrase like this, "Hello, ABC Company, this is John, how may I help you?" I hope these tips are helpful and I hope it might be apparent about the value of hiring a talented web designer, graphic designer and a writer. There are plenty of reasons to employ a good web designer. For small companies, a web designer and graphic designer can be one person, if they have the necessary education and experience. Thinking that an administrator has the necessary skills to be in charge of the office and believing their responsibilities include the creation and updating of your website (and for creating graphic design projects) is naive and will only hurt your company from moving forward in a healthy and progressive way. 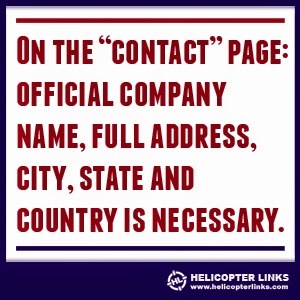 -By Mike Hampson, owner, Helicopter Links.